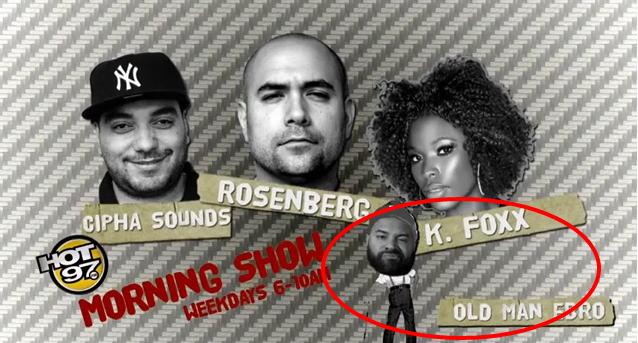 Love and Hip Hop Atlanta fans recently checked out Hot 97's interview with the morning show hosted by Cipha Sounds, Rosenberg, and star of The Gossip Game K. Foxx ... Oh yeah and "Old Man" Ebro. If you don't know who Ebro he is the program director for New York's Hot 97 radio station and you may have seen him appear on some of your favorite Mona Scott-Young programs including Love and Hip Hop New York and The Gossip Game. Click Read More To See Videos & Love and Hip Hop fans comment on Ebro! While on my daily search on YouTube I stumbled upon Hot 97's interview titled "Stevie J Calls Mimi and checks her in the middle of her interview!" video. Interestingly enough I clicked on the title to check it out and found massive of viewers going in on Ebro's lack of interest for "ratchet" reality TV and knowledge about the show and the two seasoned cast mates from Love and Hip Hop Atlanta Season 2. Viewers also questioned why Ebro was even on the morning show and not behind the scenes as his title of program manager. My thought is that for Ebro to not like "ratchet reality shows" its kind of mind boggling why he continues to interview cast from the various shows and also his recent interview with Mona Scott-Young herself. K. Foxx also said that she was not to fond of him on the show with her and her co-host on The Gossip Game. What are your thoughts? Should Ebro stay in his lane? You can check out both interviews and YouTube comments from the "Stevie J Calls Mimi and checks her in the middle of her interview!" below and tell us what you think. Newly add host on Hot 97 Ebro Darden, who is also Hot 97s program manager.